The Batman Who Laughs #1 review – AiPT! The apex predator of the DC Universe is back. Every comic book fan knows three simple truths: new comic books come out on Wednesday, with great power comes great responsibility, and Batman always wins. Batman is one of the most dangerous beings in the DC Universe and he’s just a regular human man. No superpowers to speak of, just a guy dressed up in a bat costume. And yet somehow, he’s beaten the crap out of Superman, taken out the entire Rogues’ Gallery in one night and oh yeah, didn’t blink in a game of chicken with Darkseid, and won. But what happens when Batman fights Batman? Who wins then? Perennial Batman writer Scott Snyder is teaming once up again with artist Jock to answer that question for us in the spiritual successor to their first Batman run, Batman: Black Mirror. The all-star pair are promising to bring horror to DC fans, and if their first venture together into the genre with Wytches is any indication of what fans are in for, this should be an amazing and terrifying ride. 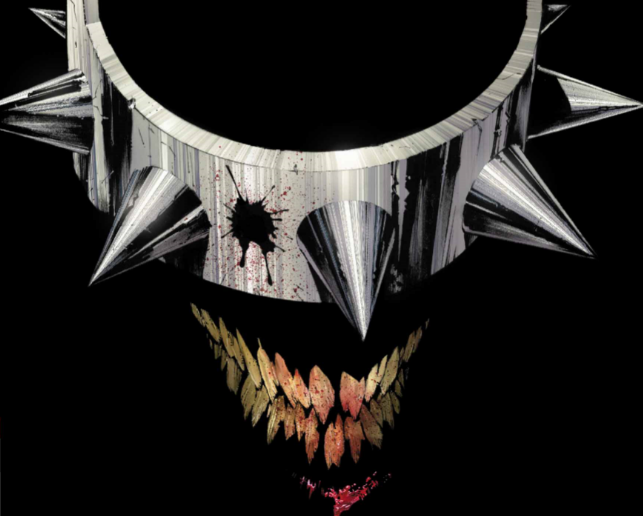 The Batman Who Laughs was last seen by Batman at the end of the events of Metal, struggling with The Joker as the cave they were in collapsed around them. Both vanished and unsurprisingly survived. With The Batman Who Laughs turning up in the basement of the Legion of Doom headquarters, seemingly as a prisoner of Lex Luthor. After striking a deal with Luthor, The Batman Who Laughed vanished. Until now. Returning with the worst Batman to ever stalk the Multiverse is a new Dark Knight, The Grim Knight. This version of Batman is straight out of the worst night of Bruce Wayne’s life, the night his parents were shot and killed in front of him. The Grim Knight breaks two of Batman’s strongest commandments: no killing and no guns. Within moments of appearing he’s bringing cold hard death to the halls of Arkham Asylum, leaving no doubt that he’s quite possibly Batman’s greatest challenge yet. It can be argued that the only reason The Batman Who Laughs didn’t kill Batman the last time they squared off is because of the intervention of The Joker. Unfortunately for The Joker, that wasn’t something The Batman Who Laughs has forgotten or forgiven. And deep down neither Batman nor The Joker appear to believe that things will be any different this time around. Ever since we were first introduced to The Batman Who Laughs I’ve felt that the majority of the community has focused on the Joker aspect of his duality, parting from the understanding that this character isn’t the Joker, he’s Batman. Just by looking at the character you can see where that comes from — he’s got the Joker’s trademark maniac smile, white skin, red lips and of course, the laugh. Furthering that end, all we’ve ever seen of his visage is his mouth, which again has heavy emphasize on a Joker trademark. Snyder leaves no doubt who sits at the head of the worst of the worst’s table; The Batman Who Laughs is the ultimate apex predator of the DC Universe. He’s everything Batman is: the training, the memories, the intellect, and none of the none of the moral safeguards. Anything and everything that could stand in his way is cleanly, efficiently and meticulously annihilated. But don’t allow yourself to be fooled by the brutality of the Grim Knight or the twisted origins of The Batman Who Laughs, his madness has a method to it. Not everything is simply blown to pieces or gutted like a fish, some of his plots are far more intricate. Batman finds himself dealing with one such head scratching plot right out of the gate. At this point we don’t know how or why The Batman Who Laughs does almost anything. For perhaps the first time ever, Batman, the man will a contingency plan for everything, doesn’t know what to do, and that makes The Batman Who Laughs even more terrifying than his already disturbing visage does. Snyder uses that mystery, and helplessness to stoke the fear of unknown surrounding this character into a dark unsettling bonfire. Which brings me to Jock. If you have any experience with him, you know he uses a lot of blacks and excels at using the smallest of details in all the right places. He puts your eyeballs right where he wants them with a few simple lines. As you can see from the image of The Batman Who Laughs above, I wasn’t exaggerating — he’s pretty damn good at it. The first thing every person will see on that page is the smile on the face of The Batman Who Laughs. While Batman may more often than not dress in blue and grey, his color is undoubtedly black. With Jock and black being the best of friends, the results of this pairing are a feast for the eyes. The tone of the book is in large part set by Jock’s use of black; everything and everyone feels so down and hopeless. There are a lot of amazing artists out there who have drawn a really impressive Joker, but I might have a new favorite on my hands. Jock’s Joker looks so incredible rabid, dangerous and just oozes a manic insanity. It’s just plain awesome. Humans fear the dark. We always have and we probably always will. It comes from a primal, animal part of our brain. Darkness is an unknown — anything could be in there, there’s no control in there. And why do we fear the dark? Simple, because we can’t see. We’ve all been there at one point — you’re in a poorly lit basement, there’s a single bulb hanging amidst cobwebs and you hastily pull the cord, only to get a small touch of light that brings forth a room full of indiscernible shapes and shadows. It’s almost worse than it is without the light. All the shapes and shadows have your mind running wild, seeing imagined horrors in boxes of Christmas decorations, dusty furniture and your family’s assorted basement junk. Then the rest of the lights come on and you’re safe again. The lights never come on with The Batman Who Laughs. He’s patiently waiting for you as one of the shadows that could be some old furniture, or the deadliest Batman to ever walk the multiverse. Scott Snyder’s nightmarish creation is one of the best characters to come to the DC Universe is a long time. From the moment I met The Batman Who Laughs I knew I wanted more of him and man was the wait worth it. If the first issue is any indication of where this series is headed, fans are in for one of the best mini-series out of DC in years. Scott Snyder's nightmarish creation is one of the best characters to come to the DC Universe is a long time. From the moment I met The Batman Who Laughs I knew I wanted more of him and man was the wait worth it. If the first issue is any indication of where this series is headed, fans are in for one of the best mini-series out of DC in years. Jock brings to life a rabid, creepy Joker. One of the best I've ever seen. Jock uses the smallest details to the greatest effect. Your eyes go where he tells them to. The Grim Knight has sprung forth from Bruce Wayne's worst memory and goes against his two greatest commandments. Things end of one hell of a cliffhanger. Everyone is afraid, even Batman. I'm left with a pile questions and no clue of how Batman will get out of this one. That's exactly where a good writer should leave me.